Dr. Mimouni and Dr. Koletzko have assembled some of the world's leaders on breast milk for preterm infants to provide a current overview of the benefits and barriers. 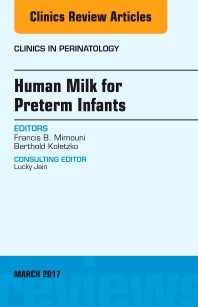 Authors address the following topics: Preterm human milk macronutrient composition; Bed-side human milk analysis in the NICU; Human milk fortification; DHA supplements; Potential benefits of bioactive proteins in human milk for preterm infants; New insights into variations of metabolite and hormone contents in human milk; Immune properties of human milk in relation to preterm infant feeding; Human milk oligosaccharides; Treatment and quality of banked human milk; Use of donor milk: collection, storage and safety; Postnatal CMV infection through human milk in preterm infants: Transmission, clinical presentation, and prevention; NEC and human milk feeding; Neurodevelopmental outcomes of preterm infants fed human milk; Evidence-based methods that promote human milk feeding of preterm infants; and Human flavor learning: the breastfeeding experience. Lactiation consultants, NICU nurses, and neonatologists will find these clinical review articles to be very valuable.